Timely diagnosis and management of neurological diseases during pregnancy poses major therapeutic challenges to neurologists and other non-neurologist health care providers. 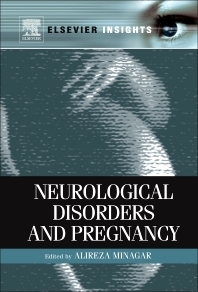 Pregnancy is a unique period in life associated with significant hormonal and other physiologic changes in female patients, which may trigger or alter the course of neurological and psychiatric disorders. In addition, many diagnostic procedures that can be performed in non-pregnant women are prohibited during pregnancy for safety reasons. Therapeutic decisions and management of a pregnant patient with neurological disorders heavily depends on the issue of the reasonable balance between the risks of no treatment versus active treatment for the mother and her fetus. This book provides a review of the latest findings in this field, giving the neurologist and non-neurologist the information they need to determine the best treatment. Neurological disorders covered include multiple sclerosis, stroke and epilepsy. Dr. Minagar is a Professor of Neurology at LSU Health Sciences Center in Shreveport, Louisiana. He’s a certified Physician Investigator by Association of Clinical Research Professionals, member of the editorial board of Future Neurology, Neurological Research, and Alzheimer’s Disease Research Board. Dr. Minagar is the author of 231 journal articles and 33 book chapters, and editor of 10 books.